Extremely fast production - even next day delivery! 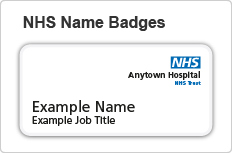 Price includes an appropriate number of reusable name badge card inserts, free of charge with each order! Our unique printed reusable chalkboard name badges. Great for pubs, restaurants, cafes and lots more! with your badges to write and erase with ease! 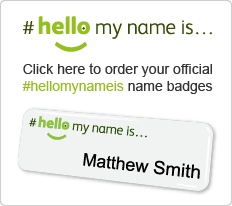 We're the leading name badge supplier for the #hellomynameis campaign! Looking to order more than 2000 name badges? Minimum order just 1 badge! Our most popular range, available in five sizes and six border colours offering fantastic variation. Design for illustrative purposes only. 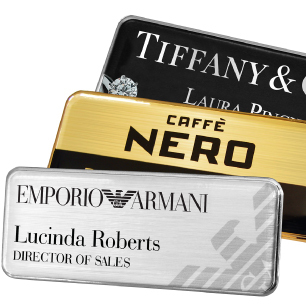 Exceptional quality metal name badges, available with Silver or Gold border in a choice of five sizes. Our basic name badge. Full colour print on a white badge, one size... simple! Plastic name badges with full colour print right to the edge. White or black edge and multiple sizes. The convenience and speed of reusable badges, without compromising appearance. Metal window badges ideal for changing names. Brushed silver or brushed gold background. Our borderless round name badges with full colour print and a domed resin coating. An alternative to the rectangle. Uniquely shaped oval and oval top badges. Our unique reusable chalkboard name badges. Great for pubs, restaurants, cafes and lots more! Custom-made school badges with a scratch-proof resin coating and a pin fitting with safety catch. With 145 employees and 39 years of staff name badge printing experience, Name Badges International is your ideal partner for beautiful quality personalised name badges. 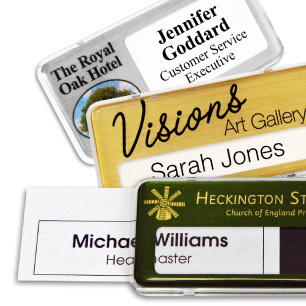 The staff name badges themselves are available in a range of shapes, sizes, colours and materials, allowing you the freedom of choice to design the perfect name badge for your company. Our name badges come with a choice of pin, clip or magnetic badge fittings for greater flexibility, allowing you to choose the most suitable attachment method for your particular workwear. For free help, advice or name badge design suggestions please give us a call on 01790 755 855 or email us using the contact form.